Lima is shrouded in history with glorious Spanish colonial buildings and grand museums dotted throughout this grand capital. The Amazon Basin contains the biggest river by volume and the largest tropical rainforest in the world. We discover the incredibly rich biodiversity of this environment on a journey by boat and on foot. Soak up the colourful local life in the former Inca stronghold of Cusco. Visit the ancient ruins of Machu Picchu – the lost city of the Incas. Spend a couple of nights on a private island on Lake Titicaca, then discover the ruins of ancient Tiahuanaco. La Paz is the highest capital city in the world and combines a modern cosmopolitan city with ancient traditions, creating a vibrant finale to our adventure. 17 Nov, 24 Nov, 8 Dec 2019 departures, subject to availability. Welcome to Lima, Peru. On arrival at Lima’s Jorge Chavez International Airport, you’ll be transferred to your hotel in the well-known coastal suburb of Miraflores. In the afternoon around 2 pm, there will be a welcome briefing at the hotel with your Peregrine tour guide. Please look for a note in the hotel lobby or ask reception where it will take place. We’ll be collecting insurance details and next of kin information at this meeting, so ensure you bring these details to provide to your leader. If you’re going to be late, please inform hotel reception. Straight after the meeting your leader will take you on a walking tour of downtown Lima, including the city’s historical centre. Flanked by streets of ornate mansions, palaces and churches, Plaza Mayor is the best place to start any exploration of Lima. Take a walk through the old streets to get a feel for colonial life. On one side of the plaza is the Cathedral of Lima, which houses the remains of Lima’s founder, Francisco Pizarro. The Cathedral is closed on a Sunday, so we’ll only see it from the outside. Visit the nearby San Francisco Monastery, with its catacombs containing some 70,000 human remains. Continue onto the Central market where you’ll take a walking tour. The market has a huge variety of fresh produce on offer, including fruits, vegetables and even guinea pigs. You’ll also have the opportunity to try some local Peruvian fruits and street food. Next head away from the tourist trail and visit ‘Alameda de Chabuca Granda’ an area really only known to locals, it is a place where people go as a treat to enjoy a variety local street food and authentic Peruvian desserts such as ‘Mazamorra Morada’ a sweet porridge made from purple corn or ‘Picarones’ Peruvian donuts made from local squash called Macre and sweet potatoes served with a sweet syrup, these are a must try whilst in Peru! The tour will finish in Lima main square, you may choose to stay in Down Town for dinner or take the included transfer back to Miraflores. This morning starts nice an early with a transfer to Lima airport at approximately 5.30 am. Fly from Lima to Puerto Maldonado today, which should take around three hours, including a 30-45 minute stop in Cusco (During this stop you will not disembark the plane). The flight will arrive into Puerto Maldonado airport just before midday. Take a short drive to the lodge’s office in town. Upon arrival at the jungle lodge office you will be provided with a small duffle bag to pack your personal items required for the duration of your jungle stay. The remainder of your items will be stored securely in the office. From the office it’s about an hour drive to the Port of Inferno. Leave civilisation behind and venture deep into the Amazon rainforest by motorised canoe, upriver to your jungle lodge in the Madre de Dios region. During the boat journey, you will be given a packed lunch provided by the lodge. Upon arrival at the lodge, it’s a 15-20 minute walk, you won’t be required to carry your bags. Once you arrive there is time to unpack and unwind before a short orientation and briefing. After dinner, your local jungle guide will take you out into the jungle on a night walk. Your leader will take you on walking tour of Cusco today. Visit the Coricancha Temple for a tour with a local guide. Once plated in thick gold, the Spanish built a Dominican church atop its walls. Soon after head to the San Pedro market, where you can practice your bargaining skills and take some colourful pictures. The tour will also stop at the Plaza de Armas in the heart of the city. Here you will again see the main cathedral (this time from the front only), built on top of an Incan palace and one of the city’s greatest repositories of art. This morning travel by private bus for around two hours through the Sacred Valley, on the outskirts of Cusco. Known as Wilcamayo by the Incas, this valley was greatly treasured because of its climate, fertile land and the presence of the Urubamba (Sacred) River. Long the main source of food for the high Andes, maize crops can be seen surrounding the river and covering the terraces carved high into the valley walls. You will visit the fortress of Sacsayhuaman where massive stone blocks that form the walls of this site give you an impressive picture of how greatly developed Inca engineering was. Looking over the city from its hilltop position, the fortress is the ultimate example of the Inca’s military strength. 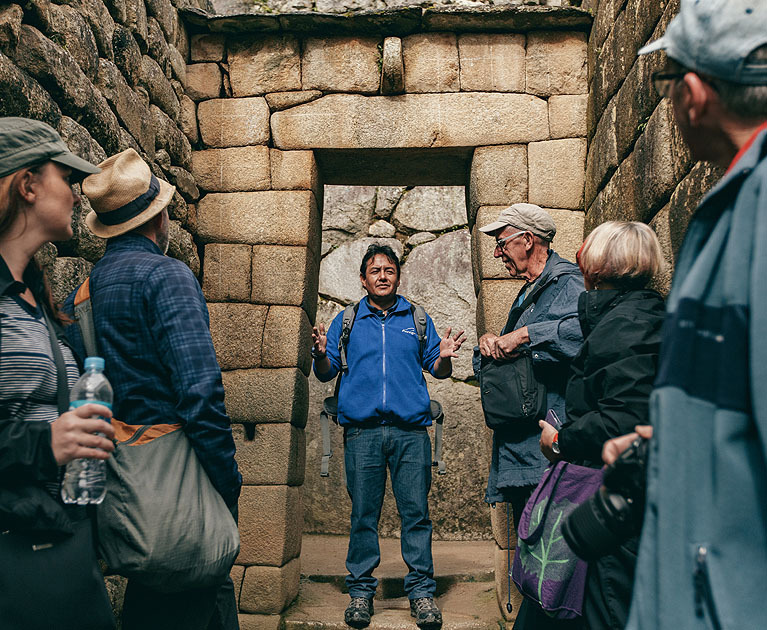 En route to Ollantaytambo you will visit multiple workshops in the Chichubamba community to gain a greater insight into the local lifestyle with an included lunch and visit to some local workshops. After the community visit, continue on to Ollantaytambo. Ollantaytambo was built over an ancient Inca town, the ruins of the royal estate of Emperor Pachacuti. This is one of the few places where the Incas defeated the Spanish. It’s a magnificent example of Inca urban planning and the perfect warm up for Machu Picchu. Ollantaytambo’s archaeological site is located to the east of the Plaza de Armas. The upper terraces of this site offer great photo opportunities of the squared grid town below. Today you’ll see lots of evidence of the Incas’ engineering skills – in the ruins of ancient aqueducts, irrigation canals, dams on the Urubamba River, imposing sets of terraces and centres of worship dedicated to Pachamama (Mother Earth). Late afternoon head to the hotel in Ollantaytambo and settle in for the night. Nestled in the cloud forest at the foot of Machu Picchu, your destination today is Aguas Calientas. Depart the hotel just after 7 am and travel by train for around 90 minutes through the winding Urubamba Valley to reach the town. From here take a 30-minute bus up the winding road to Machu Picchu where you will be joined by a guide who will take you through the ruins and tell you stories of its history and the ancestral people of the region. Looking at Machu Picchu for the first time, as it sits against a backdrop of forested mountains, is a truly breathtaking experience. No matter how many photos you’ve seen, it is hard to prepare for its awesome beauty. The true purpose behind Machu Picchu may always be a mystery, since no historical records of the complex exist. In fact, none were made in the first place, since the Incas had no written language. Some historians have argued it was a place of spiritual worship; others, a military stronghold, and some even think it was a prison. Most archaeologists, however, believe it to be the 15th-century headquarters of ‘he who shook the earth’, Emperor Pachacuti. You will have a guided visit (approximately 1.5-2 hours), then free time to wander around. Depart the hotel at around 5.30 am this morning and take the bus back up the winding road to Machu Picchu arriving at Machu Picchu around 6:30 am. On your second visit to the ruins you’ll have free time to explore and take any photos you may have missed yesterday. Why not take a walk up to the iconic sungate and take that postcard picture! Further explore more of the extraordinary architecture of the many temples, palaces and living quarters, where the mortar-free design is particularly earthquake resistant and the stones are so precisely cut that to this day not even a knife fits between them. Before midday take the bus back down to Aguas Calientes. Enjoy some lunch in town and perhaps have head to the local artisanal market to pick up some souvenirs. Later take an afternoon train to Ollantaytambo arriving late afternoon. From Ollantaytambo, take a private transfer back to Cusco arriving around 7 pm, just in time for dinner. Today enjoy free time to relax, shop or explore more of Cusco’s sights. Perhaps head to a cafe on the Plaza de Armas. There are many optional activities available in Cusco, please refer to the list below and speak with your tour leader if you wish to book any of these in. Depart the hotel just after 7 am this morning. Travel by bus for around 7- 7.5 hours to the tiny but unique town of Puno. This direct tourist service will take you on decent roads through spectacular mountain scenery. You will also drive through the large sprawling town of Juliaca on your way to Puno, which is a colourful and lively place renowned for its traditional street dancing, often performed in celebration of Catholic festive days in February each year. Arrive in Puno at around 330 pm located on the shores of Lake Titicaca, a melting pot of Aymara and Quechuan Indian culture where traditional Andean customs are still strongly represented. The town is known as the folklore capital of Peru and is famous for its traditional dances. Many festivals are celebrated here, especially the Virgen de la Candelaria, so if you’re lucky your visit might coincide with one of the colourful evening parades, when the streets fill with costumed dancers and musicians. Head to the hotel in Puno and settle in. Shortly after your leader will take you on an orientation walk of Puno town. This evening perhaps head out for dinner with the group, your leader will be able to recommend some great places to eat. This morning, we leave the hotel just before 7 am and set off to explore Lake Titicaca. Be enchanted by the striking scenery and unique cultures on a cruise around Lake Titicaca today. As Lake Titicaca is the highest navigable lake in the world, the sun can be extremely strong, so make sure you wear a hat and sunscreen, even on cloudy days. Stop by the floating Uros Islands. The Uros people constructed these islands to isolate themselves from rival tribes in ancient times. They are built completely from multiple layers of totora reeds, which grow in the shallows of the lake. Next call into Taquile Island for some woollen handicrafts. On the island, knitting is strictly a male domain, while women do the spinning. At approximately 1 pm, retire to the private island of Suasi where you’ll spend the next two nights. This afternoon you may want to venture out on a walk around the Island or why not head to the spa and book in a massage. Tonight, enjoy an included dinner at the lodge. This morning depart the hotel at approximately 7 am. Travel by minivan to Desaguadero (approximately 2.5 hours), where you’ll cross the border into Bolivia. The first stop is the Peruvian migration office where you’ll be asked to leave the bus and proceed through Peruvian migration. Then walk via a bridge to the Bolivian side, submit your passport at the Bolivian migration office and reboard the bus, which will continue to La Paz. About 30 minutes after crossing the border there’s another stop where the army will again check your documents. Remember to reset your watch, as Bolivia is one to two hours ahead of Peru. On your way to La Paz, stop at Tiahuanaco for a guided visit. The archaeological site of Tiahuanaco was the base of a great civilisation that began around 500 BC before mysteriously ‘disappearing’ around AD1200. It is believed that the ceremonial complex dates back to the AD800 and was once at the centre of a powerful and self-sustaining empire based in the southern Central Andes. It is also where the Incas learned about building systems and agricultural practices. The sprawling ruins comprise of temples, courtyards, terraced pyramids, monolithic stone statues and gateways. The most famous structure is the Puerta del Sol (Gateway of the Sun). From the ruins it’s a two-hour drive to La Paz, where you’ll spend the night. Enjoy spectacular views of the city on your approach, due to its unique location in the middle of a vast volcanic crater. At around 3600 metres, La Paz feels like the top of the world and vies with Tibet for the title of highest capital in the world. 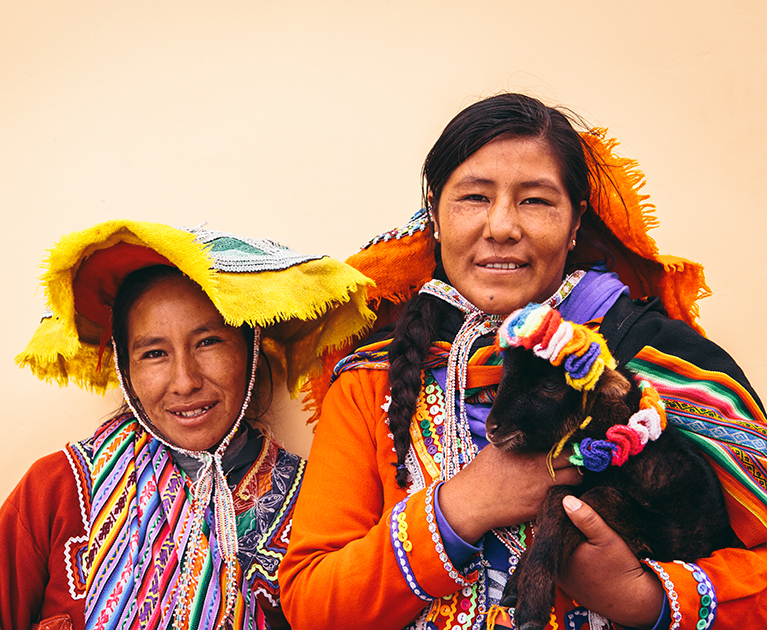 Despite the abundance of colonial architecture, La Paz’s indigenous roots run deep, and the atmosphere in the market-filled streets is both modern and traditional. This morning at about 9 am you’ll embark on a city tour. Begin with a dramatic ride on the world’s highest ‘urban’ cable car, up at 13,000 feet connecting La Paz with its twin city El Alto, a challenging urban environment that is a mix of shacks, half-finished buildings and church spires. Here you will visit some craft markets, selling goods made of alpaca wool, leather and other traditional materials, before visiting the Mercado de Hechiceria or Witches’ Market. Browse the weird and wonderful stalls that sell everything from potions to incantations made from herbs. This witches market is rarely seen by tourists and is much more authentic than the smaller witches market in La Paz. Just outside the market is a street with dozens of types of doctors or shamans that, for a price, can tell of your future health, love, or career. Reboard the cable car to the south of the city and take a walking tour of the extraordinary landscape of Moon Valley. This isn’t a valley, but a maze of canyons and colossal clay spires. These rugged oddities, caused by erosion, make for staggering views. Stop at Mirador Killi Killi for one of La Paz’s most impressive viewing points. Next head to the main square and Plaza Murillo. After lunch, the rest of the day is free. When the sun sets and the temperature drops, join the locals in seeking warmth in a bar or restaurant. Advertised prices are person twin share, cruise only and correct at time of publication and are subject to availability and change at any time without notification due to fluctuations in charges, taxes and currency. Offer is valid on new bookings only. ^Bonus is included in the advertised price. Receive a free Urban Adventure up to the value of $150. Deposit of $600 per person per trip is required upon booking. If booking within 56 days of departure, full payment is due immediately. Urban Adventure cannot be transferred to another person. Urban Adventure offer is not redeemable for cash, and non-refundable. Qantas Frequent Flyer (‘QFF’) members are able to earn Qantas Points when they book an eligible Peregrine Adventures trip. Customer will earn 1,000 Qantas Points per eligible trip. Qantas Points will only be earned on transactions that occur after adding your Qantas Frequent Flyer membership number to purchase. Please contact qantas.com.au to check your membership details. Other conditions apply. Please contact your personal travel manager for full terms and conditions.